Posted in Misc and tagged Donald Trump, Russia at 12:37 pm on January 29, 2018 by Bodger. Well yeah, that’s possible, and I expect that’s why, pending the outcome of various hearings, it’s treated as more of a joke than anything else – the whole pee-tape thing was hilarious for about five seconds until you remember that Trump has been accused multiple times of sexual assault and harassment. Except by Republicans, of course, who act as if it is literally the entire foundation of all concerns about Trump’s Russia connections and that the dossier is the ‘roadmap’ to impeachment. There is no roadmap to impeachment. The Republicans will never impeach Trump, no matter what. As far as I’m aware the Mueller investigation has nothing to do with the dossier. 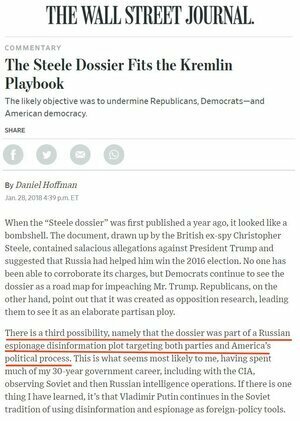 You’ll note that while it is possible that the dossier was part of a widespread effort to target the US political system, neither Trump nor the rest of the Republicans will countenance any effort to deal with it as a serious threat, though they will, of course, use it to attack Clinton. This may not necessarily be the case, if the rethuglicans do badly in the upcoming elections in November they might be inclined to ditch him for Pence or someone else. Also if they do badly then the Democrats will have done well and that would certainly change the dynamics of the situation. Also don’t discount the possibility of him being charged with obstruction of justice, so interesting times ahead. One claim in the dossier is that the Kremlin was assisting Trump for at least five years, with the aim of encouraging “splits and divisions in western alliance”. So let me get this straight Nigel, you think it’s plausible that this was all in fact fabricated by Putin – that it was in Russia’s interest to whip up Western hysteria against itself, damage it’s own international reputation, incur harmful sanctions – all in the hope that one day both the Reps and the Dems would end up blaming each other over the dossier? Oh Bodger, you never give up. “Democrats see the dossier as a roadmap for impeaching Mr Trump” = what we adults call establishing a straw man. I suspect the Mueller Inquiry will have lots of info way beyond that dossier that will be impeachment friendly. In fact, even outside the remit of the Mueller inquiry, there are other things that are grounds for impeachment . Payments from campaign funds to, ahem, actresses anybody? There isn’t a roadmap to impeachment, there’s a whole freaking atlas! I’m sure Ms.Daniels provided a much needed service to the campaign. I have to say that I see the President as more of a giver, or observer, when it comes to pee-gate, so I never bought that line. Dog and pony show for the easily distracted. Daniel Hoffman was brilliant as Ratso in Midnight Cowboy. Almost a year since you promised your imminent Pizzagate revelation. Any word on that at all?